Craftea objects in front of you , with no user interface and seeing objects as when they are on the floor. 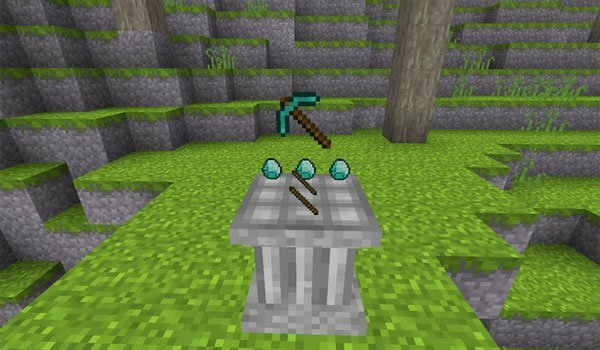 Crafting Pillar 1.7.2 and 1.7.10 is a mod that is a few days old and so far only adds a new object, the Crafting Pillar, a pillar that has the same function as a crafting table . What differentiates a regular crafting table apart from its aesthetic, is that we can create objects directly on the surface of the block, looking like both the objects we use in the recipe, as the result of crafting , objects will look like when they are in the floor , in three dimensions and rotation. Another difference is that if you forget an item in the recipe for example , we should not re-create the entire recipe because it is stored on the surface that we have placed items . To remove an item from the recipe you have to press “Shift ” + right click and collect the crafted object , right click on the pillar. The author of the mod is developing a new dimension (we can see the background of the picture above). How to install Crafting Pillar Mod for Minecraft 1.7.2 and 1.7.10? Start crafting objects in 3D!